It was my first week back in action after nearly four months and thankfully my wrist held up well. Going out to play was a worry for me as I wasn’t sure how it would be once I started going at shots full out, so to get through the week with it holding up so well was great. My thumb was a bit stressed, so I had to take it easy with the amount of practice I did during the week. After so much time in a cast I had to be careful to manage my come back properly. It was great to be back playing again. It is only when you are out of action that you realise how much you enjoy playing and competing. I’ve been watching a lot of golf while I was injured and dying to get back at it. I have been lucky in my career that I haven’t had too many injuries up until recently. So I didn’t really miss too much when I put it in perspective of my whole career. I was happy with my performance; I finished in a tie for 30th but it could have been so much better. I felt that I didn’t play my best, which was probably to be expected, just not by me! However the really frustrating thing about the week was that I was -5.9 in Strokes Gained for putting and the only thing I could do and did do for the last four months was practise my putting. You would have assumed that I would come out and hole everything after all that practice! In my first competitive round of the year I shot 2 under par which, considering how I drove the ball, was a good effort. In my warm-up for round 1 my launch monitor estimated my handicap at 20, and my on-course effort wasn’t much better. As a result, during the round I used my fairway woods from the tee as much as possible rather than trying to sort my driver out on the course. It was all a bit of a struggle but I managed to get myself around and was delighted to sign for a 70. Friday was similar in terms of play but not as good in scoring terms. I shot one over par for a two round total of one under and one shot inside the cut. My weekend was better, I shot 71 and 69. I showed better signs in terms of play but there was a lot of rustiness. However, overall I am very happy with my performance – I made 19 birdies for the week, which was great, but unfortunately I had too many bogeys. A lot of my bogeys were down to rustiness and some missed putts, but I am confident that I can tidy up those types of mistakes once I get back into the full swing of things. However the overwhelming success of the week for me was that I added a fourth wedge in my bag and it was a huge success. I led promity to the hole with my wedges in 2012 and then for some reason I went back to carrying 3 wedges. After seeing the difference this week I will be sticking with 4 wedges going forward. I am coming away from Kuala Lumpur very happy with my performance and how my wrist held up. Normally I wouldn’t be happy with a tie for 30th but after being out injured for four months it is a good start back. As I head home I have a few things to think about with my swing and what areas of my game I need to concentrate on. I’ll be doing some practice during the week but I have to be careful not to over do it. Padraig finished in style on his comeback from injury with a solid round of three under par 69 to finish at five under par and a top thirty place on the leaderboard. Remarkably, he birdied the exact same six holes that he birdied on Saturday and will be pleased to have come through unscathed. This will kickstart a run of tournaments for Padraig as he builds up to the main part of the season. He is also confirmed to play in the Irish Open being held this year at Lahinch Golf Club where he last played and won in 1995! Disappointing finish to a promising days work for Padraig in Malaysia. Starting on the back nine, he got off to a slow start with a dropped shot at his second hole but picked it up with a birdie four on the par five 13th hole. he then had a lovely run around the turn, where he reeled off four birdies in a row. But a poor bogie, bogie finish put paid to a good round of golf. He lies at two under par for the tournament heading into Sunday’s final round. A second round of one over par sees Padraig finish at one under par at the halfway stage of the Maybank Championship. He got off to a nice start with two early birdies but three dropped shots in a row saw him out in level par. He covered the front nine (his final nine) in one over par recording eight pars and a bogie. Eight under par leads the tournament going into the weekend. Padraig tees off at 8.30am local time on Saturday with Ross Fisher and Matthew Southgate. 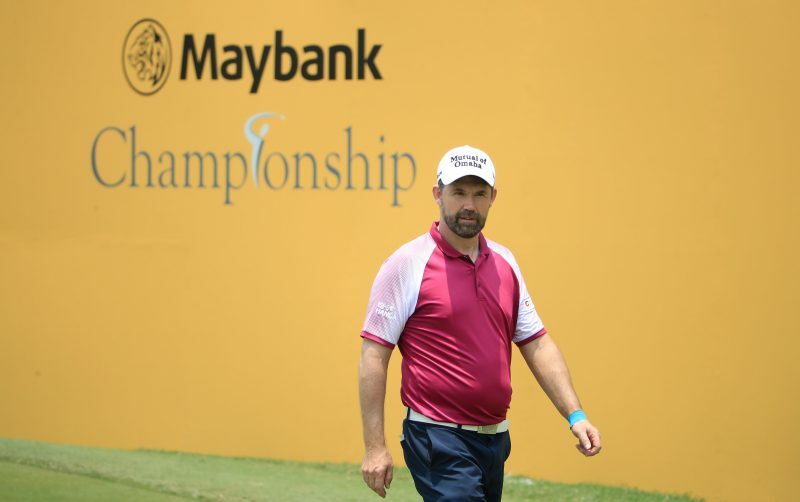 A fantastic return to form for Padraig after a nearly four-month layoff, he opens his account at the Maybank Championship with a two-under-par round of 70. Starting on the back nine, he recorded four birdies on the day and just two bogies but most pleasingly had six 3’s on his card. He reported no ill effects with his wrist after and tees off Friday, early at 8.20am. Padraig tees it up at long last after a niggling wrist injury in Kuala Lumpur, Malaysia for this weeks Maybank Challenge. The Ryder Cup trophy will be on display as Thomas Bjorn and Padraig both play this week. Major champion, Ernie Els is also in the field. Padraig tees off in the opening round at 1.05pm local time with Gavin Green and Kurt Kitayama. After nearly four months since my last tournament, I am back in action this week at the Maybank Championship in Malaysia. It has been my longest break from competitive play since I turned professional, maybe even since I started playing golf. The reason for this was because of a broken bone in my hand, but when I found out it was broken I never thought it would keep me out for so long. After every other injury I have had over the years, I have come back quickly and I assumed that this would be the same. However, my recovery has been well behind my expectations. This is also my first tournament since being named as the Ryder Cup Captain. Since it’s been a while I have got used to it, but this week everyone is congratulating me on my appointment. It’s been nice as it’s brought back to me how big a deal it is and how much it means to the European Tour. I started hitting shots last week to get myself ready and even then I was taking it very easy. It wasn’t until I got here that I began swinging full out. I arrived on Sunday so that I could get three days playing before the tournament starts. On Monday I played 16 holes, on Tuesday 9 holes and then 18 in the pro-am on Wednesday. I’ve done some practice too, but nothing like I would normally do. I am very conscious of my wrist and not wanting to put it under too much strain. So far it has been fine, but I’m getting physio twice a day to ensure that it holds up. It’s been a funny few days as I have been mainly concentrating on my wrist, but as the holes went by and it appears to be okay I have been trying to get back into playing golf. This is my first tournament since the middle of November and I can see the rust. When I planned my schedule before I broke my wrist, I would have seen myself being here fully into my season and very competitive. So being here as my first event and trying to see where my game is at is not ideal. It’s been a typical first week, some things are looking fine but I can see the areas of my game that need work and time. As always I’d love to have a more time to get ready but the thing that I have come to realize over the years is that you are never quite sure how your game is until you test it under pressure. By the end of the week, I will have a good feel for what I need to do and for where my swing is at. This week we are playing at Saujana Golf and Country Club. I’ve played here a few times over the years and in fact, was beaten in a play-off by Vijay Singh in 2001. I’ve always enjoyed coming out here to Malaysia to play. While it’s extremely warm it has never really bothered me – I make sure to take on lots of water and luckily I don’t sweat too much. The course was remodeled last year and all the greens were relaid. As a result, they are quite firm which is unusual for this part of the world. It is definitely playing much harder then when I last played here – it’s more difficult to get the ball close and also there are a lot more run-offs around the greens. Over the years the scoring has been low but given the course set up this year, I am not expecting the scoring to be as good. Considering I wasn’t sure how my wrist would hold up when I was coming out here, I am happy with how my practice has gone. I’ve seen a lot of good signs in my game but more importantly, my wrist has reacted well so far. I’m looking forward to getting my season started and to seeing what my game is like under the gun. In some ways, I’m happy the course is playing tougher than normal as I don’t feel under pressure to have to shoot 20 under par. I’m excited and nervous after such a long break and it feels like I would have felt many years ago when I would be wondering if my game was still going to be there. I’m out late on Thursday and early on Friday with Gavin Green and Kurt Kitayama.